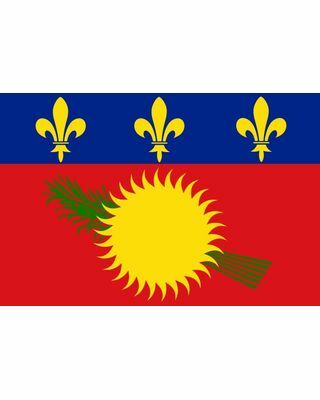 This 2 x 3 ft. Guadeloupe flag with a red field is printed of 100% nylon, hand-sewn with two rows of stitching on top and bottom, four rows stitching on the fly end, finished with canvas header and brass grommets. All our world flags are made to the United Nations Design Specifications. This is the unofficial flag that is used locally, It's based on the coat of arms for Guadeloupe's capital Basse-Terre, which has a black or red field with a yellow sun, green sugar cane and a blue stripe with yellow fleurs-de-lis on the top. This flag is made to order and may be 2 weeks before shipping.